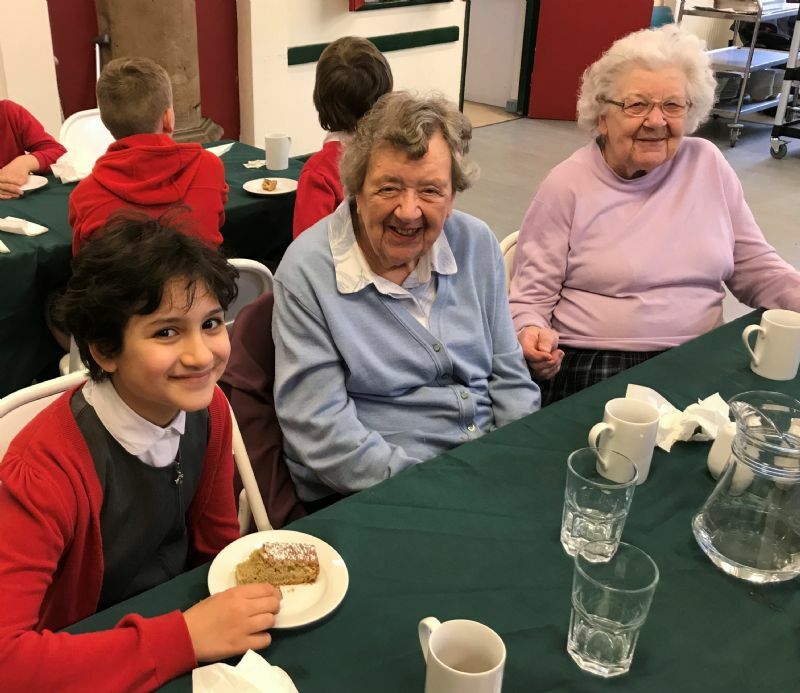 left to right (attached): 11 year-old Safa Ahmed from Chorlton Church of England Primary School joins Winifred Richards and Margaret Bell for lunch at the St Clements Community Lunch Project. For the last 18 months the St Clements Community Lunch Project in Chorlton has provided hot and cold meals to elderly and infirm pensioners in the area. The local Church of England primary school supplies the meals to St Clements parish church, where the monthly lunches are hosted, while their schoolchildren help serve the food and clear up afterwards. Its a project close to the heart of Dave Perkin  the owner of Manchesters Frog and Bucket comedy club  who went to that same school and was baptised at St Clements. So he donated complimentary comedy night tickets for Manchester Trailblazers Rotary Club to sell and raise money for the project. The £250 windfall is now being spent on new dementia-friendly cutlery and crockery. Its a great project that brings together children and pensioners spanning eight decades, says the Rev. Daniel Valentine  curate at St Clements and president elect of the Trailblazers.